Since the beginning of gambling when people needed a way to keep track of their winnings, there have been a endless number of styles of gambling chips (also known as tokens or checks) In this article, we will take a look at the most common materials used today in the manufacture of modern gaming chips. Today, you can purchase chips made from plastic, clay composite and acrylic composite. Most professional gamblers prefer to use clay chips. However, there is really no such thing as a clay chip. Most clay chips are actually some form of composite with some clay mixed into a strong impact resistant polymer mix. 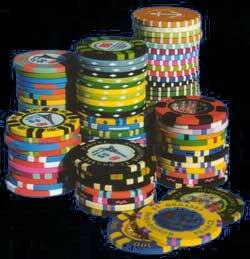 Modern clay chips have been referred to as �James Bond� style casino chips. Clay composite chips are quite expensive and because they are very popular, its often hard to find them anywhere in stock. The weight of these chips is usually between 8 grams and 11.5 grams. The standard size is about 1.5 inches or 39 mm. Chips made totally from clay were used during the latter half of the 19th century in the U.S. They we re easily broken and were soon replaced with more durable composite clay chips. Early in the twentieth century, chips were made from Plaskon, a ureaformaldehyde molding substance. By the 1930s, chips were made with an added die cut metal foil to provide identity and security. The 1950s was a boom time for the casinos. Chips made during this time had casino logos and designs molded into the chip itself. Today, every casino has its own special chip with its own combination of materials and design. Some have metal disk centers and plastic on the rims. There are cloth fiber reinforced polymer molded chips and even all metal chips anodized in a variety of bright colors. Most regular home players like to use composite chips. They are similar in weight to standard casino chips at 8g to 11.5g. They are very strong, readily available and can be easily customized by stamping and decaling for increased security. Composite chips are made using an injection molding process with a special plastic that does not soften when heated. The chip is molded around a metal slug to create a chip very similar in weight and feel to real casino chips. These are usually made in China or Taiwan. Gambling professionals have noted a difference in quality in chips made in these two countries. Chips made in Taiwan seem to be of better quality. Chips from China have often been found to be warped, vary in size and color imperfections and lack of uniformity in the surface of the chip. If you plan to buy chips, it's always wise to request a sample. The first thing casinos have to consider with regards to their chips is security. Casinos have their chips made by only a few bonded companies in the U.S. Every casino uses a special blend of composites in an effort to prevent counterfeiting. Casino chips have copyrighted designs molded into the chip in high security facilities. Most casino chips are composites made with a metal core and laminated center. You can only get these at a casino or a reseller that will usually sell them for more than face value. These chips vary in weight, but usually weigh about 10g. Plastic entry level chips are the most economical and can be purchased just about anywhere. The quality range is wide from very chip �toy� chips to heavier 7g chips. They are easily damaged and offer no security. These chips are a good choice if you are new to gaming and have a limited budget. These chips are perfectly fine to use for your home game. When your home game becomes a little more serious you should consider getting a set of clay composite or composite metal core chips. Always request a sample when purchasing higher end chips. Before you start laying down your bets at the craps table make sure you know what you are betting! The different colors of chips indicate a different denomination. Most casinos follow the same color coding of casino chips. White or blue chips are usually $1. Red chips are $5 and are called �nickels�. Green chips are $25 and are referred to as �quarters�. Black chips are worth $100. Purple chips are worth $500 and are often called �barneys�. Orange chips are worth $1000 and are referred to as �pumpkins�.